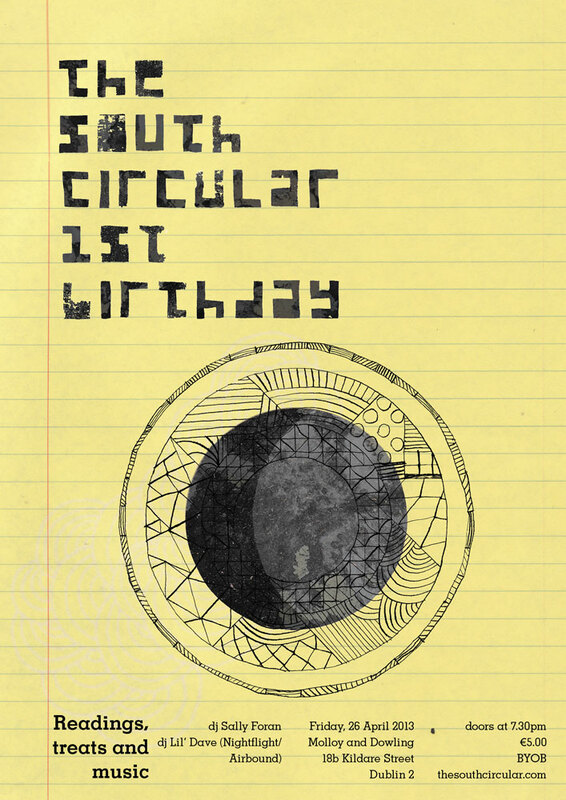 We are celebrating one year in publication with a very special evening of readings, nibbles (tbc) and music. This will be an opportunity for us to say THANK YOU to all of the writers, readers, artists, editors, friends and collaborators who have made the first five issues of THE SOUTH CIRCULAR possible. And it will give you the chance to say HI! to our virtual journal. Stories from the back issues of our ejournal will be read to you and djs Sally Foran and Lil’ Dave will play to our hearts’ content until midnight. We’re delighted to be able to hold our party in the cosy surroundings of Molloy & Dowling Dispensing Opticians, one of Dublin’s newest stores. We are confident that the space will encourage intimate listening and showstopping dancing in equal measure. They even have outdoor/indoor caves for you smokers! Our party will be BYOB, doors are at 7:30pm and capacity is under 100 so do come early to hear some of our favourite stories from the last year. We’re putting a €5.00 admission fee on the door. All proceeds from this will go back into the costs of the night and anything left over will go towards our next year of publication. We’ll also be selling A3 posters of the five front covers by some of the best visual creators in the business today. This is a unique opportunity to take home a piece of our commissioned artwork. So, put your best gúna/geansaí on and join us for a night of stories, beats and baked treats.